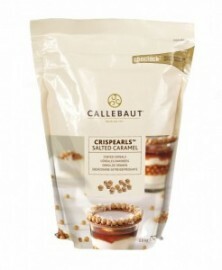 Crispearls are made from the finest chocolates, then enrobed over a crispy core of toasted cookie. This delicious combination delivers an overwhelming taste sensation from a 4mm round pear. Adds flavour, crunch and eye-appeal to pastries, desserts and sweets. They even keep their taste and crunch, when mixed into ice cream, mousses, chocolate and other moist fillings.